One of Ian’s jobs on this project was to convert ‘amazing spaces’ like this, Hotel Pelirocco’s Sing Star Suite, into both a workable studio and a relaxed, creative songwriting environment. Pro7ect 2017: producer Ian Wallman describes a unique collaborative project in an unusual space! 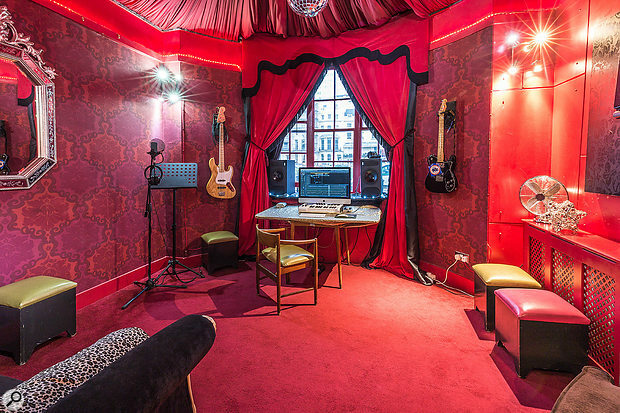 Imagine building five pop-up recording studios in a rock & roll-themed hotel on Brighton’s iconic seafront, on England’s south coast, then inviting 24 songwriters, producers and musicians for a week of non-stop music collaboration. I’m describing 2017’s Pro7ect songwriting retreat, during which, with the help of a team of producers, 24 artists completed 20 tracks in four days. It was exciting, inspiring and, yes, a little crazy, but a refreshing project with unique challenges. We achieved some great results, too, so I was happy to be invited by SOS to tell you how, from a production and engineering perspective, we approached this unique event. 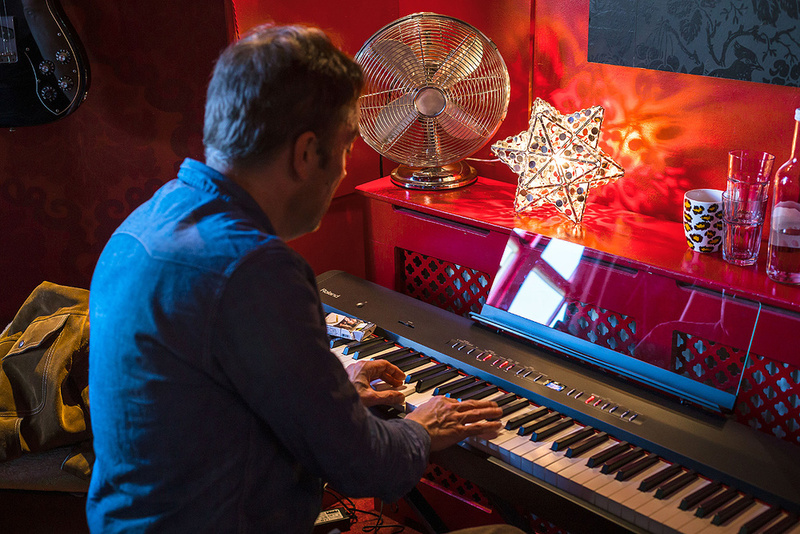 The original idea behind Pro7ect, an annual event that began five years ago, was to put a songwriting camp, modelled on a professional collaborative studio environment, in an amazing and inspiring location. With its elegant regency exterior and eclectically themed rooms, Hotel Pelirocco is just that — amazing and inspiring. As Pro7ect House Producer and Technical Manager, I was responsible for converting five of the hotel’s bedrooms into temporary professional studios. Although I obviously took into account the technical requirements of our headline producers, I also tried to focus on the creative songwriting process as much as the technical possibilities; the studios needed to be both comfortable and convenient so that artists could ‘plug and go’. I could write a thesis on setups and gear for a typical Pro7ect event, but I don’t think SOS would find the pages to accommodate it, so while I’ll talk in general terms about Pro7ect setups at times, my main focus will be a specific writing session and studio setup at this year’s event. As with most such events, the organisers sought partnerships with manufacturers who might be able to sponsor the event by loaning us suitable gear — but catering for the headline producers at a Pro7ect event can be complicated, and we couldn’t just accept anyone’s help; the gear had to be fit for purpose. Previous producers have included Martin Glover aka Youth (Killing Joke, the Verve, Sir Paul McCartney), Roni Size (Mercury Award-winning producer and DJ, founder of drum & bass collective Reprazent), John Fortis (Razorlight), Paolo Nutini (the Prodigy, Laura Marling), Andrew Levy (Brand New Heavies), Stew Jackson (Massive Attack) and Liam Howe (Sneaker Pimps, Lana Del Ray, Ellie Goulding). Such producers obviously know what they’re doing and how they prefer to work, but I have to remember that they too are working outside their comfort zones — in an unfamiliar location, with unfamiliar gear and collaborating against the clock with people they may not have met before — so it’s crucial that the gear is not only high spec, but also easy to use and reliable. The Roland digital piano was chosen because it could act as a good controller keyboard, but also as a quick scratch-pad for ideas, given the onboard speakers.With all this in mind, each studio at this year’s event consisted of a similar setup. There was a pair of PMC TwoTwo 6 or TwoTwo 8 monitors, a Focusrite Scarlett audio interface, a Novation 61-key controller keyboard, a Roland FP-50 digital piano, an Audio-Technica AT4033/CL large-diaphragm cardioid capacitor mic, sets of Audio-Technica ATH-M40x headphones, and G7th guitar capos. At the centre of it all was a Mac computer running Logic Pro X and Pro Tools. Artists were asked to bring their own instruments along, and they’d also have access to an on-site stock of guitars, banjos, harmonicas and percussion. Obviously you could substitute some of that gear for similar products from other brands, but hopefully you can see that this setup would allow artists to be spontaneous. For instance, the digital piano not only features weighted keys, but it has built-in speakers, and it takes no time at all to switch it on and start sketching out ideas. One of the crucial things to get right was the monitoring, and I’m a big fan of PMC speakers — I use them in my own studio, and they are, in my experience, very good and very reliable. In particular, their Advanced Transmission Line design means they can offer greater, louder, distortion-free bass than most other speakers of a similar size. So I was very pleased to be able to use them here. ‘The Long Sleep’, which is the song I’ll focus on here, is not your typical pop song. Its linear structure builds throughout the song, starting with the vocal pads, then the percussion, a subtle piano motif and, finally, a faint guitar riff. It begins with a 16-bar verse, followed by a four-bar chorus and tag. A four-bar piano motif is then followed by a second verse, this time of eight bars, and then it’s back to the four-bar chorus and tag, followed by a four-bar breakdown. It returns to the verse with a crescendo before the final rallentando, with solo vocals to the end (for more detail check out the screen of the Logic session). It was written, recorded, mixed and mastered on 15th March 2017 — in other words, day three of Pro7ect 2017. 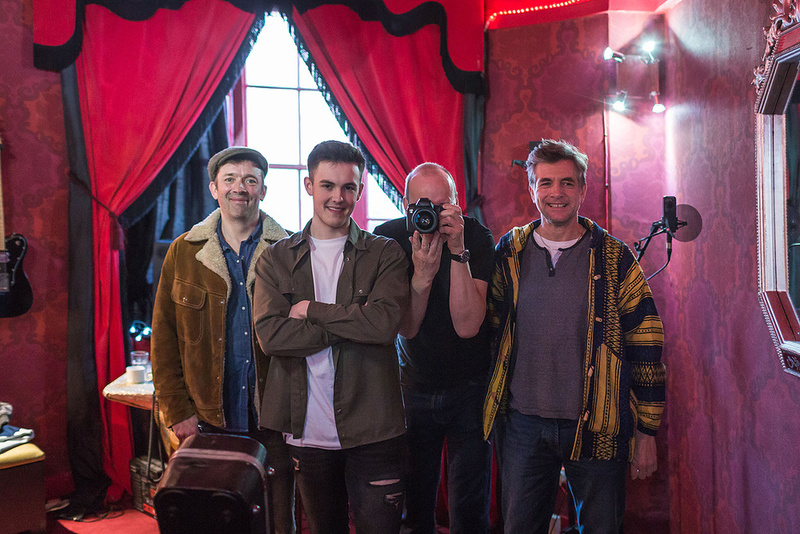 The songwriting/production team for ‘The Long Sleep’, from left to right: Will Cox, Billy Crabtree, Ian Wallman, Nigel Watson.Day three is, for me, always the creative high point of a Pro7ect week: by this time, the artists have found their groove and want to write a killer track. My studio was the Sing Star suite on the ground floor, which measures approximately 4 x 3.5 metres but has a large bay window and parallel walls. The décor is intense, with a red, crushed-velvet ceiling, low lighting, a disco ball and a chaise longue (shown above). 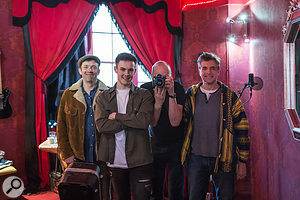 The writing team comprised Will Cox (art and drama college graduate, actor, multi-instrumentalist, musical director and singer/songwriter); Nigel Watson (Germany-based British singer, lyricist, composer-producer and ex-drummer/singer of world beat band Three Mustaphas), 18-year-old singer/songwriter and Pro7ect 2017 guest artist Billy Crabtree, and yours truly. The ‘rules’ at Pro7ect are that any one of the artists may offer an idea for development, but on this occasion we happened to run with one of mine. During my morning walk on the pebbles of Brighton beach, I got thinking about a very moving news article I’d seen recently about palliative care (www.bbc.co.uk/news/health-31871482). As a producer, I aim to create music with impact, and the idea of a ‘beautiful death’ really resonated with me and the team — so this became the focus of our song. Often, I find that songwriters are keen to jump straight into the ‘chord round’, or to start mapping things out in their DAW. Yet, I find that it’s easy to lose your focus that way, and that it’s usually much more productive to focus first on lyrics and the narrative of a song, which is what we did here. When you’re working with new people there are moments where you have to bare your soul and this is what Pro7ect retreats are all about — building genuine relationships in a creative environment. So we spent nearly three hours just discussing our personal stories and connecting with each other’s experiences, before starting to pen the lyrics. When we’d done that, we broke for lunch, before turning our attention to composing the music. A guide track was created in Logic Pro X using the Roland FP-50, and that part was developed into the vocal pad you can hear in the finished track, which we felt added a nice ‘human’ element to it. Billy came up with the melody pretty early on, and everything fell into place from there. Of course, there’s more to creating a record than writing the song; we had to record, mix and master everything on the same day! When it came to recording and programming, the emphasis was very much on letting the creativity flow. I’ve been in too many sessions where spending too long programming drums or searching for sounds does the opposite, so on this session I used a Logic drum machine preset. I wanted these drums to be functional, rather than to replicate a human performance convincingly — we’d then add more of a human feel with Nigel’s simple percussion groove, a delicate rhythm which he played on the cajon. I recorded this part using the close-miked Audio-Technica AT4033/CL. 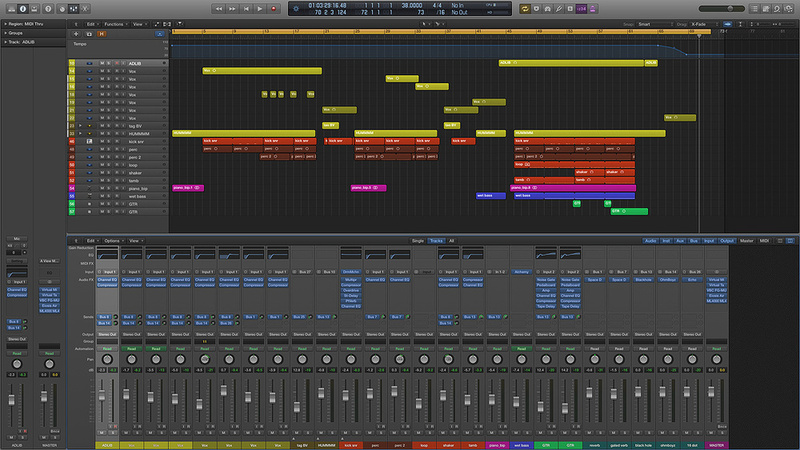 I then built an eight-bar loop from the recording, and quantised it using Logic’s Flex Time facility. The vocal pad was recorded in three-part harmony and double-tracked to give it a richer texture, so that meant we had 12 separate backing vocal (BV) parts in total. I panned them all in a Logic subgroup track at ±24 (in other words, at about 10 and 2 o’clock). The vocal pads were sung in a very low register, and there seemed to be little to be gained by panning them wider than this. Logic’s Flex Pitch enabled us to tighten the vocal tuning, but I decided not to use Flex Time on the pads; I preferred the more human rhythmic flow, which contrasted nicely with the tighter percussion beds. The BVs were all sent to an Eventide Blackhole Reverb on an auxiliary return track. I love this plug-in: it’s such a lush, big-sounding reverb that creates an otherworldly space. I recorded Billy’s vocals as we wrote the track, with a maximum of three takes at any one point. (I always keep all the early vocal takes, in case the artist starts ‘over thinking’ their performance.) For someone so young, Billy really grasped the emotional depths of the song, so I found it really easy working with him and there were only a couple of repairs and two ad libs that we comped for the final mix. Vocalist Billy’s recording position was set off to one side of Ian’s recording/mixing setup, the idea being to avoid them having to face each other all the time — which can be quite off-putting for some singers.In total, I recorded 74 vocal parts — this included all the BVs, ad libs and lead lines. I used very few effects or processors on the lead vocal: a 24dB/octave low-cut filter at 99Hz took off any rumble, and Logic’s Vintage FET compressor (a preset, but tweaked slightly to have a slower attack, a fairly fast release and, of course, a suitable threshold). I also added a bit of soft distortion via another Logic compressor. All of the vocals were sent to a single reverb (Logic Space Designer’s Vintage Gear Hall) and were treated to a little touch of delay from an OhmBoyz plug-in. I prefer working in the same room as singers and musicians, but I try to set the space up so that everyone still has some degree of privacy; I don’t want to be facing the singer, because this can be intimidating. I place the monitors and desk in the least reflective position, and the mic is usually set up alongside me, with the other instruments (Roland keyboard, guitars/amps etc.) in a circle around the room. I am sure we wouldn’t have had the same vocal emotion on the track if Billy had been in an isolated vocal booth. I don’t generally set up a separate headphone mix, but it’s still important that the singer is comfortable with the levels. I find that a compressed pre-fader vocal often helps improve the singer’s performance, as does a touch of reverb — for this session, I used a Space Designer preset called Vintage Big Hall, which is a 2.9s reverb. Our goal was to have the song finished in time for the group listening session (something that happens each evening at Pro7ect). Because of this time restraint, I couldn’t treat mixing as an entirely separate process — it was a case of ‘mix as you go’. I tended to comp vocal takes as we recorded, which not only saved time but helped to keep the session organised. I didn’t spend hours EQ’ing or compressing during the tracking session, though, and most of the mixing (EQ/compression) I did was corrective in nature, rather than for effect. I used low-cut filters on pretty much everything that wasn’t a bass instrument, and that’s something I’ll normally do when tracking in relatively noisy environments. The final Logic Pro mix/master session for ‘The Long Sleep’.Maintaining good gain structure is essential, and having worked with analogue equipment this comes quite naturally to me. On this session, as on all others, I left my channel faders as close to unity gain as possible (the faders have greater resolution at around this point, making fine adjustments easier). As I add more elements to a production, I’m constantly trimming the other tracks down, keeping everything as balanced as possible. The PMC speakers really helped with my decision-making and mix strategy — they allow me to monitor at low levels while really getting a sense of the dynamics inside the track; these elements often get lost when monitoring at very high volumes, and not all speakers sound so honest at low levels. 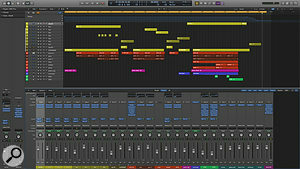 The way I managed the DAW session was no different from my usual approach. I love a tidy session, but I also like to keep everything — so I use the ‘hide’ function quite a lot! I also have my own track colour codes, which helps when I have to work on older sessions quickly. I organise my sessions with the various elements listed in order of importance — for example, vocals at the top, then the drums, then the bass, and so on. The sense of space within a track can become confused if there are too many different reverbs used, so I tend to limit myself to only two or three, and I keep all of my time-based effects on busses. For this session, I had two instances of Logic’s Space Designer (one short, one long) set up, along with the Eventide Blackhole (massively long) reverb I mentioned earlier, and two different echoes. Again, as well as helping to keep the mix uncluttered, this sort of setup helps you work quickly. 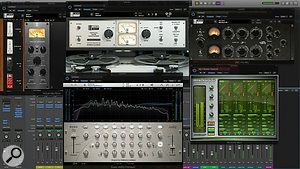 The mastering chain, described in the main text, involved subtle distortion from a number of analogue-modelling plug-ins, as well as some gentle EQ and a multiband limiter.While I did mix the track as we went along, I didn’t mix into any mastering software. Call me old-fashioned, but I still like to save the mastering for the very end of the process, just as you would with an all-analogue production. For me, mastering a single track like this is all about adding non-linear elements and ‘competitive’ loudness to the final mix. If I were working in an analogue recording studio, I’d put the audio through the desk, but for Pro7ect events I master in the box. 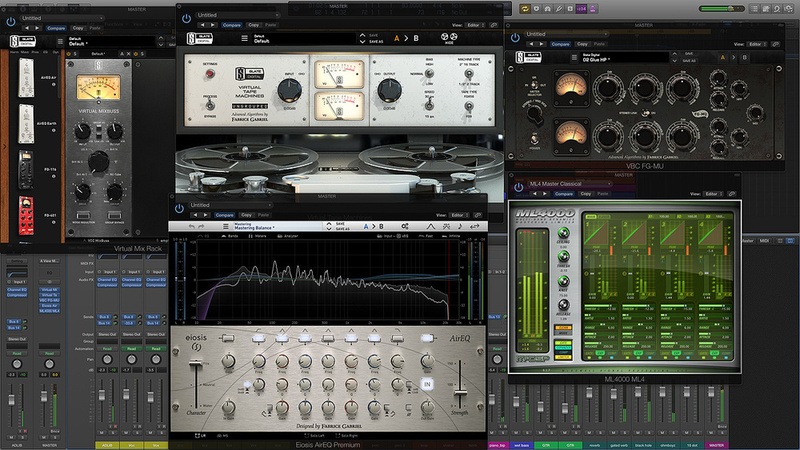 I use a number of Slate Digital plug-ins, and a select few others. First in the signal path, I use their Virtual Console Collection plug-in, which emulates an analogue mixing console, applying a bit of subtly characterful distortion and crosstalk, a little similar to an SSL 4000 desk. This plug-in can also mimic other desks, but I like the 4KE because it seems to round a bit of ‘digital-ness’ off the sound and warm up the bottom end somewhat. Next comes their Virtual Tape Machine, to add more nonlinearity and ‘warmth’. I’ll then put the track through Slate’s Fairchild compressor emulation, which helps glue it all together. Then I use Fabrice Gabriel’s wonderful Eiosis AirEQ to add a few dB using a high shelf (at about 10kHz) and a touch of low-end shelving boost (around 200Hz), along with a low cut at about 20Hz to ensure the shelf isn’t bringing up any unwanted bumps or rumbles. Finally, with McDSP’s ML4000/ML4 multiband limiter, I lower the threshold to achieve the desired loudness. As regular SOS readers will know, there are quite a few wonderful monitor speakers available now, so why did we opt for PMCs? Well, partly because I use them every day and know them to be good, but also because one of the key factors was a desire to have accurate full-range monitoring whether listening at loud or relatively low levels. PMCs have a reputation for a very clear mid-range and tight, punchy, extended bass, all of which can be attributed to PMC’s Advanced Transmission Line (ATL) design. Essentially, this is a variation on the ported speaker design, which employs a folded, angled, tapered, damped chamber to remove the harmonic distortion that often results from the bass emanating from the rear of the speaker cone. In contrast with budget ported designs, it makes them consistent and trustworthy. And in contrast with the ‘sealed-box’ technology of, say, Yamaha NS10s, they provide higher levels much further down the spectrum — in other words, sufficient low end for modern production. The only real downside of this design approach is that it adds to the cost — it’s very difficult to get advanced transmission line technology right — and that’s why there are so few such designs around. But in my opinion, they’re worth every penny: when all the decisions you make have to be based on what’s coming at you 14 hours a day, monitoring should be about accuracy! Don’t force it: if it’s just not working, you need to have the balls to scrap it and start again. Label and file everything: hiding stuff you don’t need makes DAW projects so much quicker and easier to navigate. 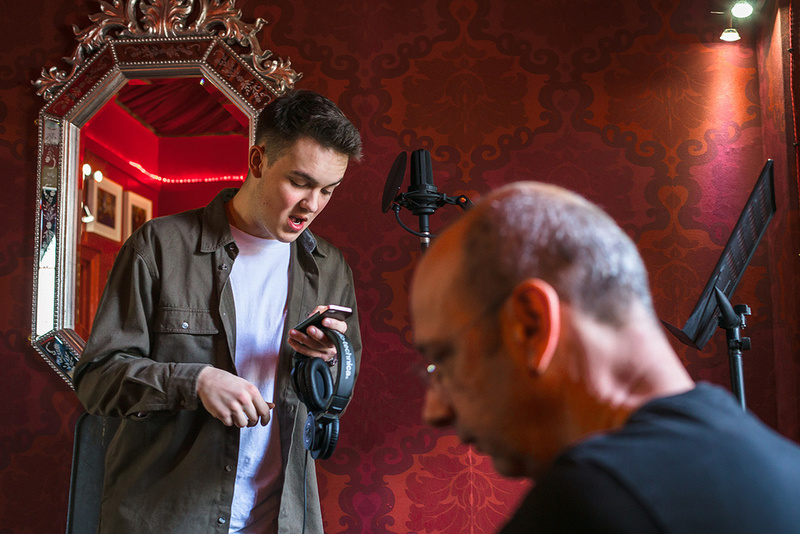 Always record first takes: make sure you’re recording even when checking the mic levels — you’ll often catch those golden, instinctive moments that can’t be recreated. One ear on/one ear off: if you’re monitoring (via headphones) and recording in the same space, try tracking with one ear on and one ear off the headphones. This helps you pick up sounds in the room that you don’t hear in the track, like foot tapping, jewellery noises and so forth. You’ll also get a better sense of the performance. Gain structure: keeping your faders at unity gain is a traditional discipline in audio engineering, as it helps ensure you set the correct levels throughout the signal chain. Use key commands to save time: the more key commands you learn, the quicker you’ll be able to work. My favourite is the zoom tool (Ctrl+Opt), which turns Logic’s pointer into a magnifying glass, speeding up navigation. I may be an experienced producer, but I still find that I can learn lessons from every project, and I’ve learned a lot from the Pro7ect sessions. Each writing and recording session is different, and as collaborators we have to leave our egos at the door; realising that, sometimes, conflict can bring out the best in a creative situation is a lesson well learned. I have also learned the benefits of minimising my personal studio space — since Pro7ect started, five years ago, I’ve stripped down my studio and gotten rid of all my outboard gear. The key components for me now are a powerful computer, transparent interface and the best monitoring available. Ian Wallman came into music production through DJ’ing and commercial Radio (Choice FM). As one half of the production duo the B-15 Project (with Angus Campbell) he hit number seven in the charts in 2000 with the UK garage classic ‘Girls Like Us’. Since then he has worked under many guises, producing and remixing for artists such as Beyoncé, Lady Gaga and Michael Bublé. Outside dance music, he has written, produced and engineered across most genres, written for film, TV and commercials, and worked in the highly specialised field of audio dubbing. In 2012 he worked as Producer in Residence for the London Olympics, recording Mo Farah among others. Since 2014, he has been working with Lisa Fitzgibbon to develop the Pro7ect brand and concept. He also takes a good photograph, apparently!